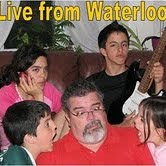 Live from Waterloo: 3D Sound! This is the coolest thing ever, I got it from Alt1040.com. Put on your headphones, close your eyes and enjoy! Esto es buenísimo, lo saque del website Alt1040.com. Pónganse los auriculares, cierren los ojos y a disfrutar!